Check out my Mama's new bloggy button!! Good Morning Everyone in Bloggy Land!! I am soooo happy....Do you want to know why I am sooooo happy! Well, I'll be happy to tell you! LOL!! It is because I have a beautiful new Button on my blog and a new widget on Entrecard!! Do you see my new button on the right side?? They were designed by Diana of Custom Blog Designs. If you are thinking of re-doing your blog, or would like to do a few little "tweaks" here and there, she is definitely your gal. I found her to be very easy to work with, even though our only communication was by e-mail, because she radiates helpfulness and eager-to-please-ness via the computer. I told her that whenever I am ready to "take the plunge" and re-do my entire blog, I am definitely having her do it! Let me explain the above: The RR WYB 2 stands for "Register Reward When You Buy Two." So, if you purchase 2 Coppertone Products in the same transaction, you will receive a $10 Register Reward at checkout. To make the deal even sweeter, you can print off a $5.00 coupon, good towards Coppertone NutraShield (using the link that I have provided). If you use your brower's back button, you should be able to print this coupon 2 times. Use either one or two coupons and you'll save an additional $5/$10 dollars at checkout. The SS stands for Smart Source; these are the coupons that come in the Sunday Newspaper. You use the RR in figuring out your total cost, because, basically, Walgreens is paying you to purchase the product. You are getting $10.00 back, so you minus that from your total after coupons. Even if I didn't have coupons for the Coppertone, I still would purchase it. However, I would purchase the less expensive Coppertone product, like the $9.99 item, buy 2 of them which would equal $20.00 and get back $10.00. So, basically, you are getting one of the Coppertone products FREE, because you are getting back, in register rewards, the price of one of the Coppertone. Love Giveaways?? I seriously do, and I had to share this one with you that I found this morning. 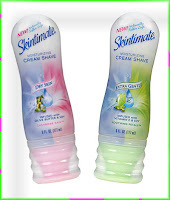 Maygan, over at MayBeFrugal has a Free Skintimate Coupon Giveaway! going on. Hop on over there, post a comment and your e-mail address, and you are entered! Don't forget to mail in the Flatmelts rebate offer. It needs to be postmarked soon. Oooohh..thanks for the reminder. I have the UPC, form, and the receipt ready to go. My Mom and Sis sent it in already (I think); I'll double check with them. I love coming here just because you are always so upbeat! Thank you for all of your help. And please tell your sister that I would love to help her make plans for revenge! Anna's bio dad was a complete monster, he put me in the hospital and everything. So I know a thing or two about a complete jerk. And I would love to help! Send her my love. Hi Helene! I know what you mean about Hobbes the Cat; I also am CRAZY about that little stripey cat! I love the new button! !She did a terrific job. And that's why you are such a wonderful bloggy friend!! Hope all is well and good by you this week! You are a very resourceful woman, thanks for sharing the all these..
Hello A.Marie! Thanks for Visitin' the Ranch and leavin' such a nice note. Love your blog and your attention to details on the transactions to get the best Bang for your Buck! Hope you stop by more often as the door is always open and coffee's always hot!